Watch The Time Prism Spin! Which area of your life needs a quick boost in power? Energy level running on empty? Have a poor, self-defeating attitude? No real mission in life? Lack crystal-clear goals or the rock-solid plans necessary to achieve them? Disorganized? Unfocused? Don't know how to get the most out of your team? Or, maybe you are constantly "getting ready to get ready" and never get to the part where you are supposed to make your life an action adventure! No Problem. We have a workshop just for you! The Time Prism separates the blur of your daily performance into 10 Color-coded bands of light so you can see exactly where you are strong and vibrant, or where you might be a bit weak and faded. If you want to take a more casual approach, our TQ Personal Workshops are a great place to start! Nothing could be easier. Improve it by becoming a Hotshot in an Hour! Each TQ workshop comes with a 1 hour downloadable audio program, advanced site access and a 65 page ebook that contains 120 great new ideas for success in that specific Color band. This is highly condensed and distilled information organized for instant access. It's like reading 4-5 great books on the subject — extracting, condensing, distilling and highlighting every major point — and walking away with just the best ideas from the best brains on the planet! 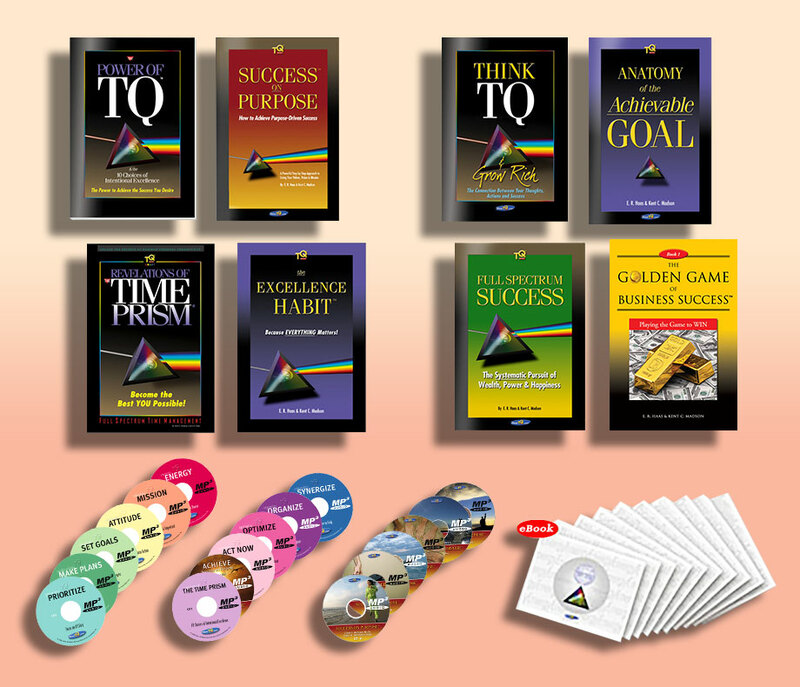 Order today and we will include our best-selling book, Revelations of the Time Prism PLUS 2 more 1 Hour audio programs: Secrets of The Time Prism and 10 Choices of Intentional Excellence... PLUS our Achieving Success On Purpose audio! Become a Hotshot in a Hour! Stressed-out, burned-out and running on empty? Increase your physical energy level and mental stamina -- by learning to commit to peak personal power each day! Make the rest of your life the best of your life! Heighten your sense of purpose and direction -- by learning how to actually live what you value most and incorporate your core personal values into every action you take. Need to start looking for the best in every situation, the opportunity in every problem? Build self-confidence in impossible situations -- by looking beyond life's problems... focusing instead on solutions and opportunities. Want the shortest path to high achievement? Transform your dreams and visions into a series of crystal-clear future expectations. Learn to expect success rather than fear failure, and key goals almost achieve themselves! Running in circles but making good time? Turn your goals into rock-solid plans -- by learning to create realistic milestones, objectives and deadlines! Remove the drama, start living up to your full potential. Remain focused on your top priorities each day -- by concentrating your time on what's most important -- rather than permit life's urgencies to grind you down and wear you out. Are you trying to be an army of one? Create powerful force-multipliers -- by broadening your team-building and leadership skills. Get and stay organized! Develop highly efficient organizational skills -- by learning to simplify, reduce and eliminate the clutter clogging your systems. Turn your time into a magic money machine! Improve your ability to manage time -- by ridding yourself of the three thieves stealing your life away: Distractions, Interruptions and Preoccupations. Stop getting ready to get ready! Take bold action to make your life an action adventure -- by learning to triumph over fear, uncertainty and doubt. Want It All... Go Gold! All of the above, plus live personal coaching, are included in the full TQ Gold System. The TQ Gold System is the most cost-effective, high-value personal coaching program yet conceived. It contains everything you need — the tools, technology, advice, people, structure, and reinforcement — to keep you connected to your goals... and committed to your performance. The TQ Vault — hundreds of hours of fantastic TeleSeminars. "The competition is brutal -- this is our edge..."
We are in a brutally competitive industry and if we don't learn to sell and compete smarter, it is the difference between us getting the business or getting out of business. This gave us the edge we were looking for.